From that sunny July afternoon onwards Johnny and Jenny were the best of friends. Despite her pretty frocks and delicate-as-porcelain demeanour Johnny was delighted to find Jenny was, in fact, a tomboy at heart. When her mother was out of sight she liked nothing more than kicking off her patent shoes, yanking the bow from her hair and rolling up her sleeves so she could get stuck into climbing trees, making dens or whatever other pursuits their limitless imaginations could conjure up. People joked that they were joined at the hip, a phrase Johnny found particularly distasteful in light of Auntie Pauline’s hip replacement operation, which had seen her incarcerated in the hospital for several weeks not long after the street party where they had first met (and which he fully disputed having played any part in instigating despite compelling evidence to suggest he’d laid a number of Tonka toy cars in her path when she had come to visit). 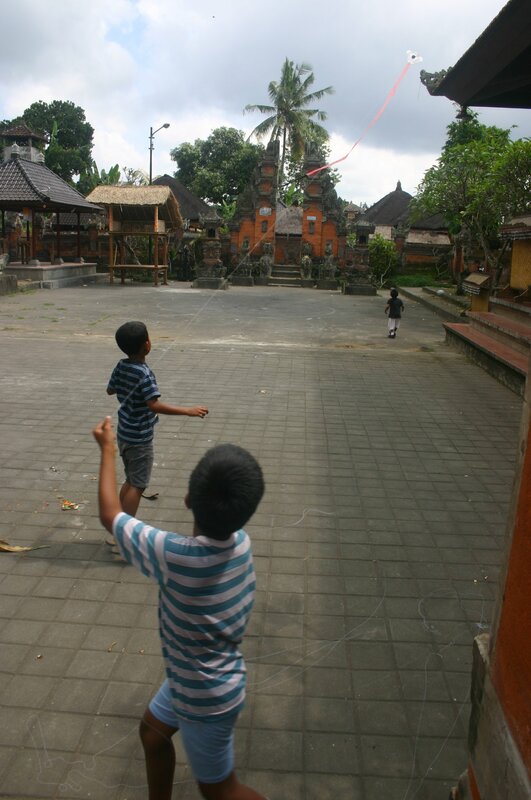 Writing this story reminded me of these boys who I came across whilst walking in Bali. They were having so much fun flying their kite, it was really heart warming to watch. This entry was posted in Uncategorized and tagged friends, July, marriage, sunny, tomboy, Tonka by Belle365. Bookmark the permalink.